I love anything personalized. 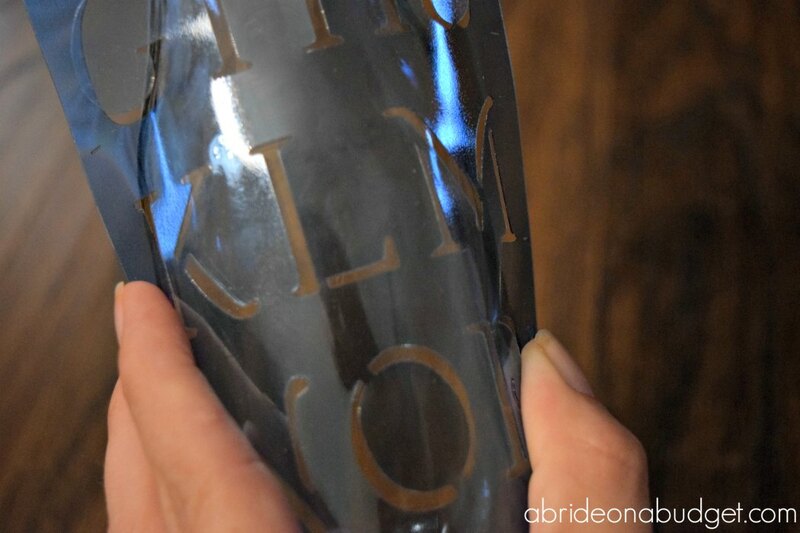 Add a photo, a monogram, a name ... I'm in. It just makes everything a little more special. 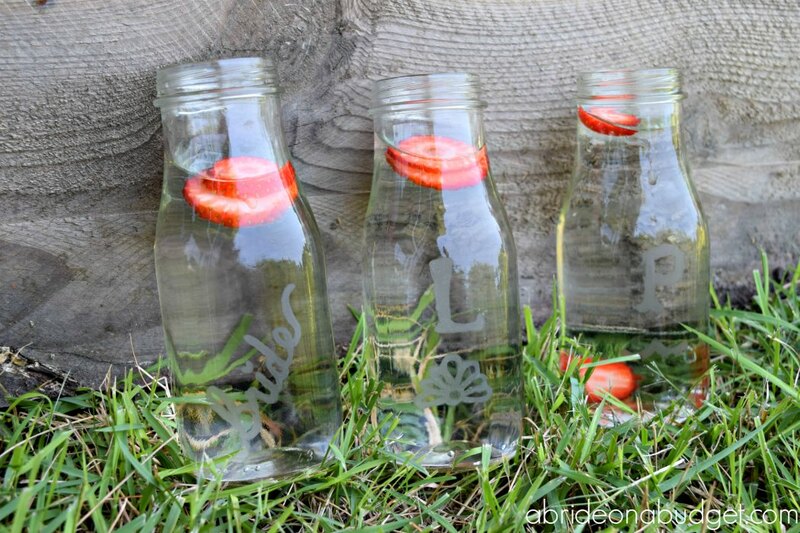 In fact, right now, I'm drinking strawberry-infused water out of a bottle with a letter L on it -- and it's amazing. Okay, spoiler alert. I made that bottle for this post. It was actually super easy to make and definitely a craft you should put together for your bridal party. You should have these ready to go on wedding morning. Make one for each bridesmaid, with her initial, and then any for anyone else coming over -- your mom, grandma, dad, whoever. They'll really appreciate it, plus they will look adorable in photos. Be sure to supply straws too. You don't want anyone ruining their lipstick before the ceremony. 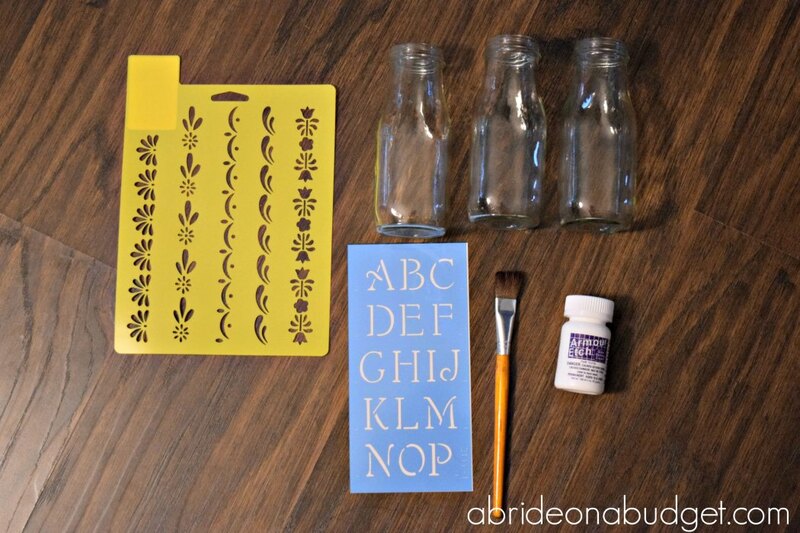 Affix the stencil to your bottle. You can tape it down if you want or just hold it down. Whatever works. 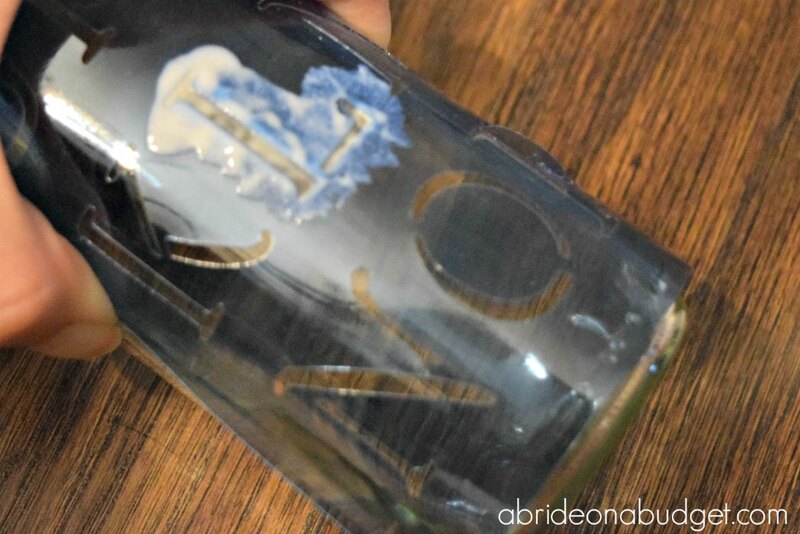 Paint the glass etching cream over the stencil using a foam paintbrush. Be careful, though. 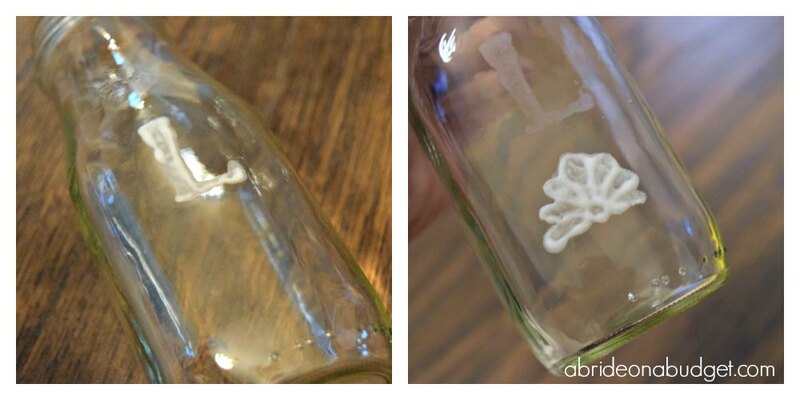 The glass etching cream is very unforgiving, so you want to make sure this isn't blotchy or spreading. You can use a small paintbrush for this if you feel more comfortable, but you may have to go over it a few times. Let it sit for at least five minutes. Rinse the cream off with water. Repeat for additional letters or images. Now, I'll be honest. I did the two lettered bottles using stencils and then I freehanded the bride one. 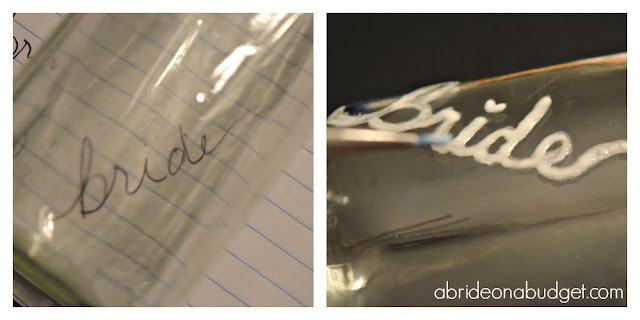 I wrote the word bride on a piece of paper, placed the bottle over the paper (since it's clear, it's easy to see through) and then I painted the word on it. I even made a heart over the i instead of the dot. Fill each bottle with water. Clean and cut the strawberries. Add a few slices into each bottle. Put them in the fridge overnight. Add an ice cube before serving. I actually really like fruit-infused water. 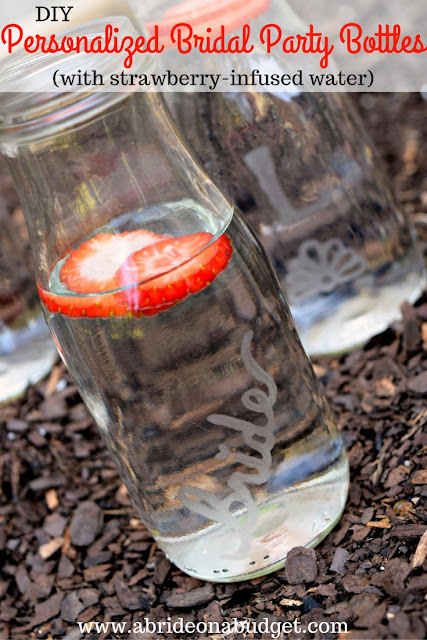 It's a good alternative to plain water and will hydrate you on wedding morning. If you want something a little more celebratory, you can always go with mimosas. BRIDAL BABBLE: What would you fill your personalized bridal party bottles with? 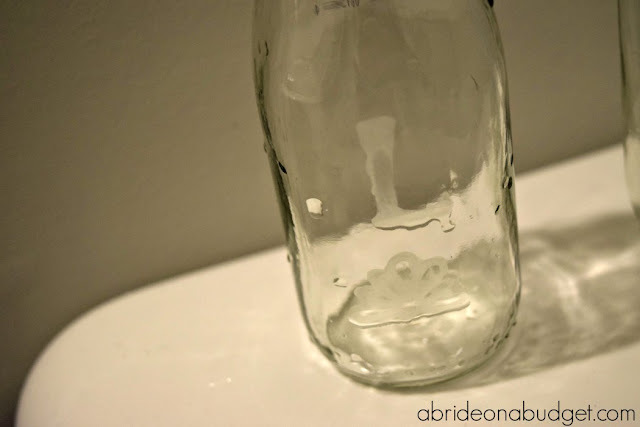 What a great idea, I like to use bottles and mason jars for serving food or dring to. Whit the personalization this could be something that you can keep as a memory as well. What a great and unique idea! I definitely did NOTHING like this for my wedding or when I was part of a wedding! lol! I would love to try this for sure. Loving the idea. They are so cute, and so easy to make. Also super affordable I bet. When I got married I made a lot of things as well. It was super fun. This is such a cute idea. I love anything with flavored fruit water, especially if it comes in a fun personalized bottle.